The Mike Gotch Memorial Bridge over Rose Creek - dedicated April 20, 2012. Photos by Matt Awbrey. Finally! The bike and pedestrian bridge over Rose Creek is finished. As an avid bike rider, I ride the circuit around Mission Bay all the time. My bicycling buddies and I have been waiting for this crucial link to be done and over with, so we can avoid running along the very busy streets that surround the Park. Photo of former San Diego City councilman Mike Gotch. 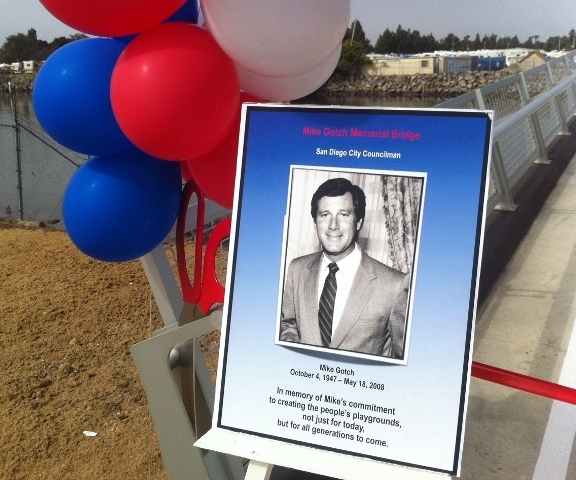 Constructed for a year and coming in at $2.9 million, the bridge – renamed the Mike Gotch Memorial Bridge after the former Mission Beach-based San Diego City councilman – was dedicated yesterday, April 20th. Many of us remember Mike Gotch fondly. He passed away a few years ago from skin cancer. 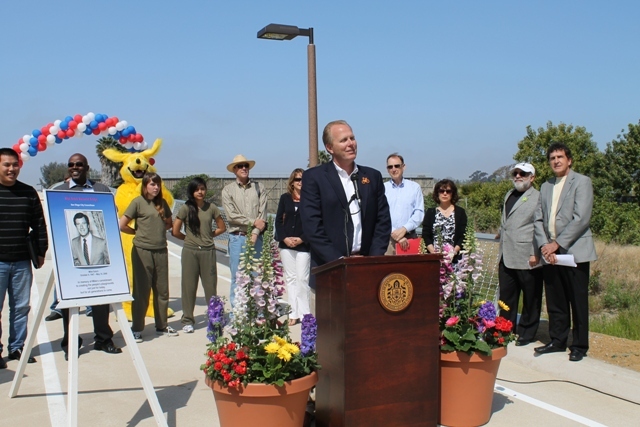 Kevin Faulconer dedicates the bridge. The 260 foot bridge is over Rose Creek – an active and alive waterway that empties into northeast Mission Bay – one of 3 real creeks in the area – connects North Mission Bay Drive to Pacific Beach Drive. 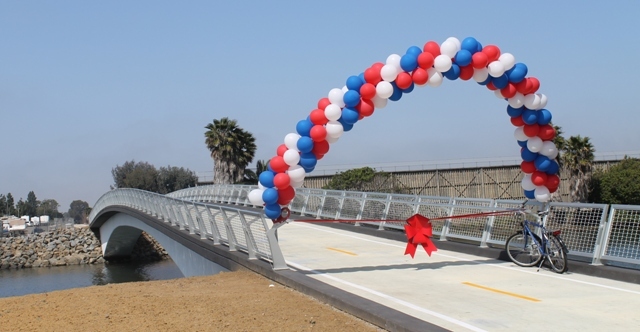 The City also promises that “a total of 0.28 miles of new bikeway will be constructed from Rose Creek to Lee Street, between the properties of Mission Bay High School and Campland.” Go here for more City background info on the bridge. Councilman Kevin Faulconer – who represents Ocean Beach – was on hand to dedicate the Memorial Bridge as Council President Pro Tem. The new bridge does nearly complete a bike and pedestrian path that goes around Mission Bay. I say “nearly” because bicyclists still have to take a few street sections to complete the loop. 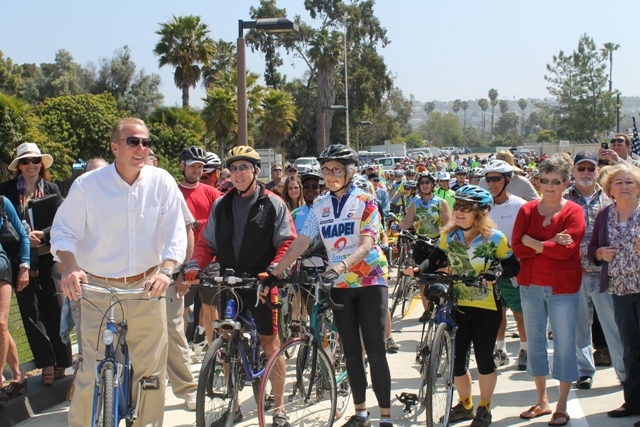 Cheers to bike-friendly development in San Diego! Now all we need is more more more more more more…. Haleluyah baby! On my bike ride today I noticed a bit of construction going on at the beach at Brighton St. Could be a restroom structure, no? Is this restroom coming in at $2.9 million? I may have missed an update on this very important edifice going up in OB. Gitmo Dave loves riding his Cheney/Rummy/Blair bike all over OB and Mission and PB. At last! A bit of bike-friendly access in Pacific Beach. Keep going and get rid of the Door Zones, especially with all the unsympathetic traffic that roars through here. The next step is a more viable bikeway along the creek, rather than the narrow one that goes under bridges and dumps everyone out on a steep little hill at a busy intersection. Is it also being connected to Pacific Beach Drive — could still prevent cars from cutting through, but the link would allow a lot better access from the interior of Pacific Beach.